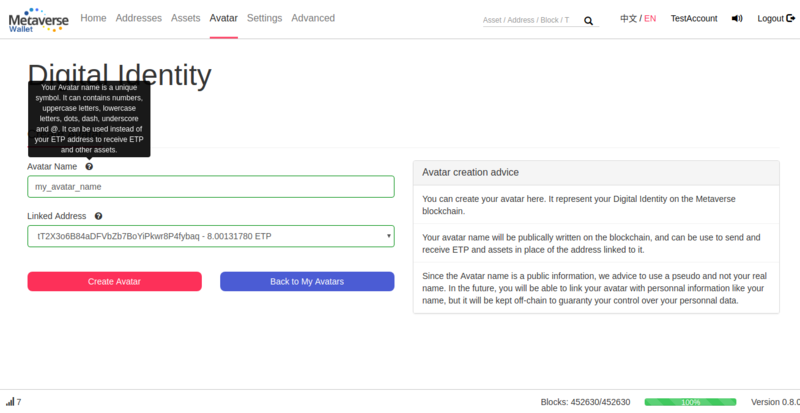 From Supernova, a MST can only be issued from an Avatar, so please make sure to create an avatar first. It is also this Avatar that will receive the new MST created. 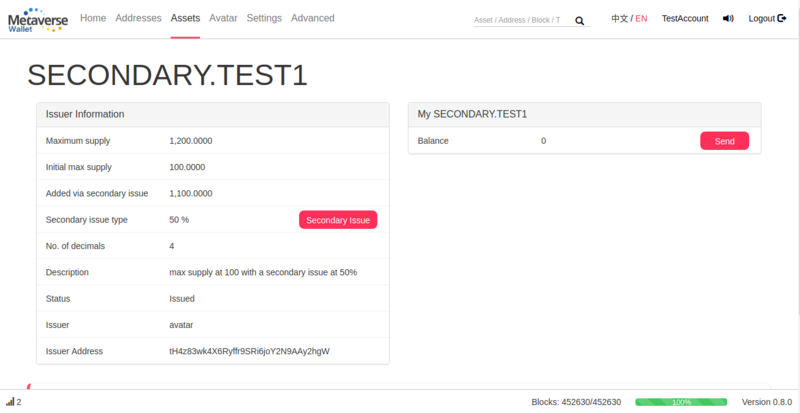 You now have the option to do Secondary Issue in the future. If you select this option, you, as owner and creator of this MST, will receive a certificate giving you the permission to issue more of this MST in the future, and so increase its maximum supply. Secondary issue impossible: The MST is not allowed to be secondary issued forever, the Maximum Supply is fix and cannot be changed. 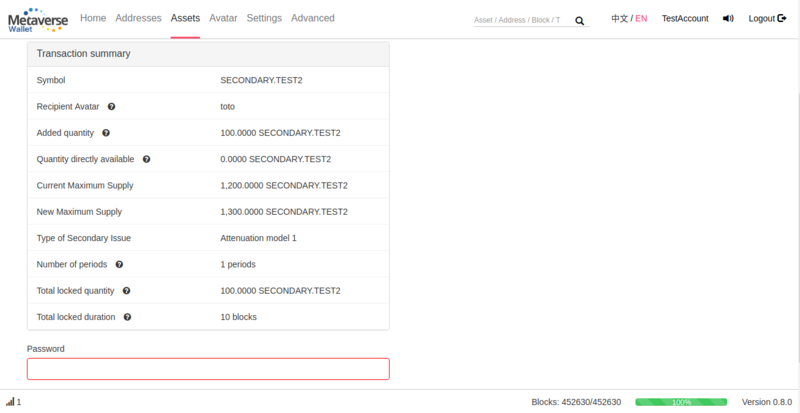 In that case, you will not receive any Secondary Issue certificate, since this option will not be available. This is the default option, and all the MST created before Supernova are in this category. 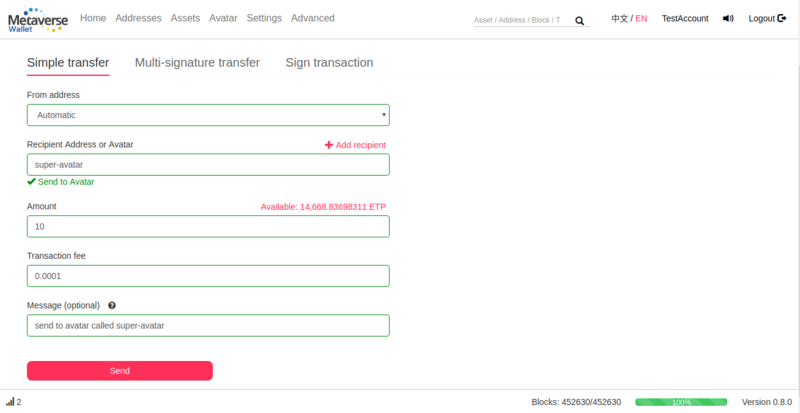 Similarly to ETP, an Avatar can also be used as the recipient to send a MST. You can also decide to freeze the asset, that you are sending to yourself or to someone else. 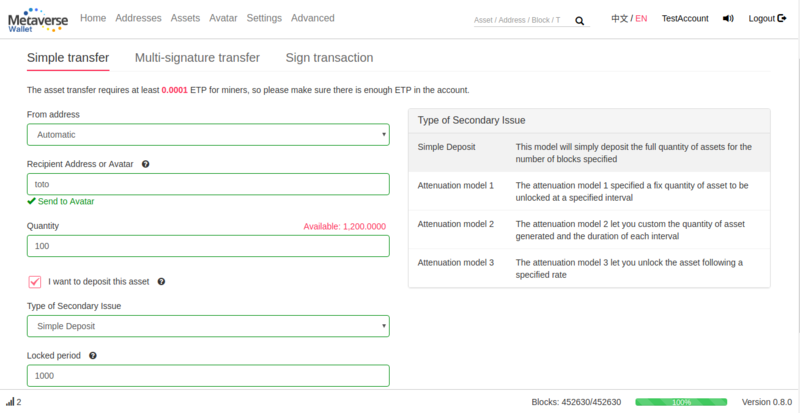 Please note that at the opposite of ETP Deposit, freeze a MST does not generate an interest. 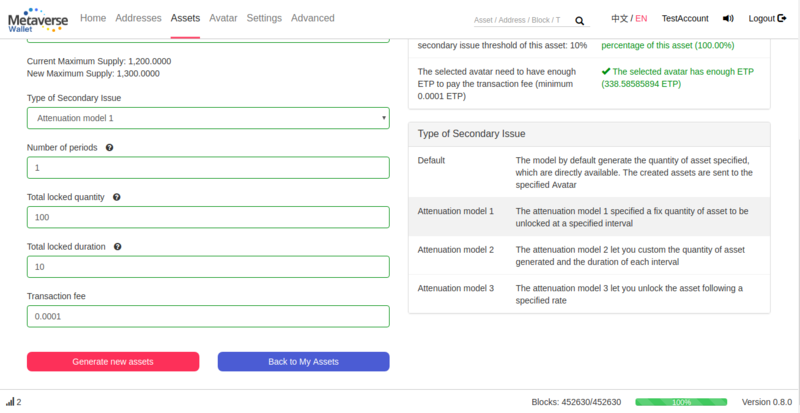 This option could for instance be used during an ICO for investors who would accept to have their MST frozen in exchange of a discount price to buy the MST. 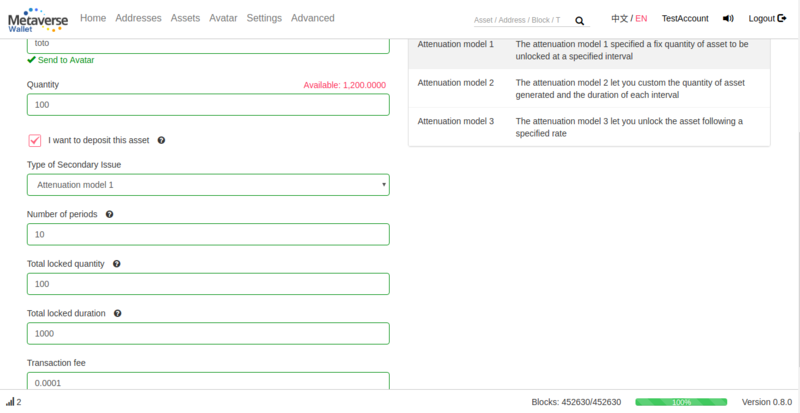 You can also decide to use one of the Attenuation model, to gradually unlock the MST at a specified frequency. 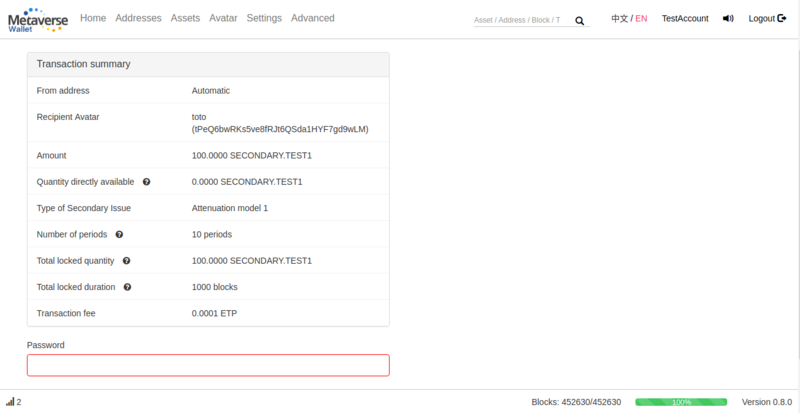 Please make sure the model used match your expectations in the confirmation. 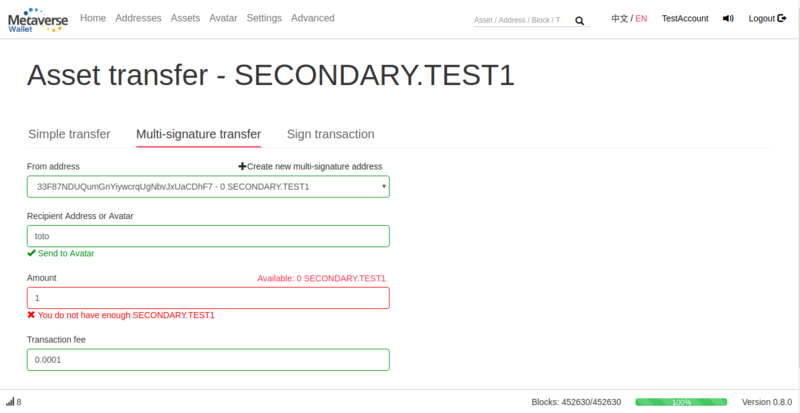 Note that you can now also use a multi-signature address to send and receive a MST. 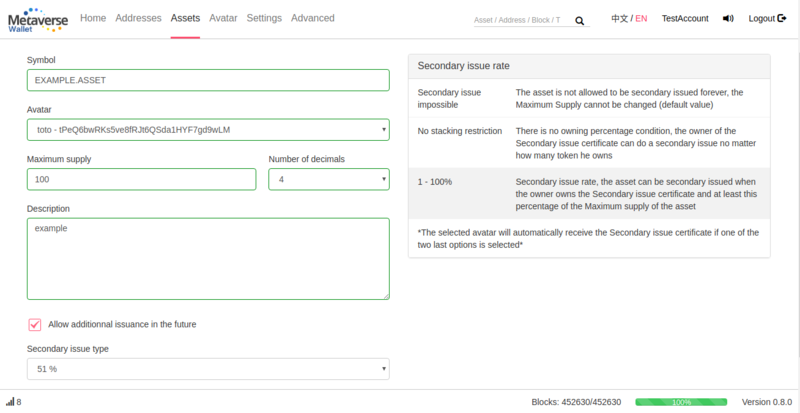 If you own the Secondary Issue certificate of a MST and match the required owning percentage (if specified at the asset creation), you can do a secondary issue by going to the MST page (click on its symbol in the ‘Asset’ page, or search for its name in the search section of the top bar). 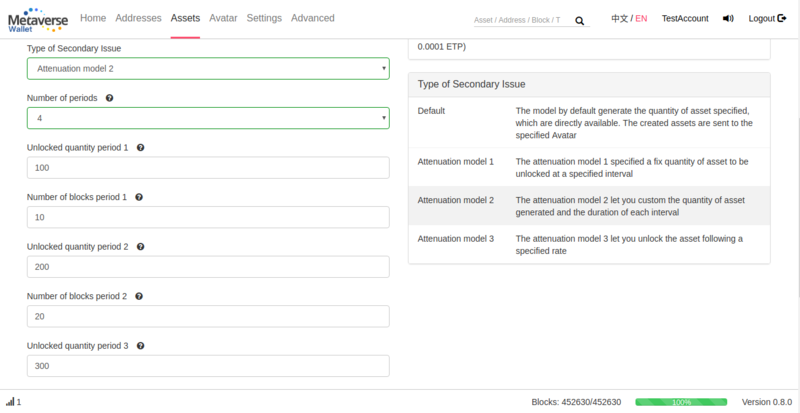 There, you can see the general information of this MST and click on Secondary Issue if the option has been specified. 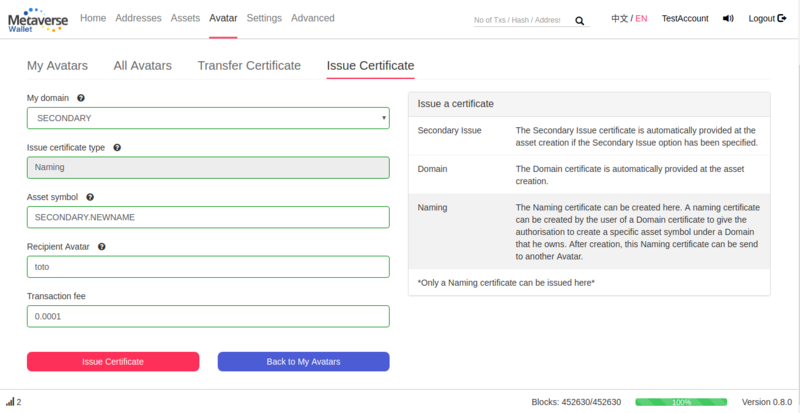 Secondary Issue: This certificate give you the permission to do a Secondary Issue on a specific Asset. 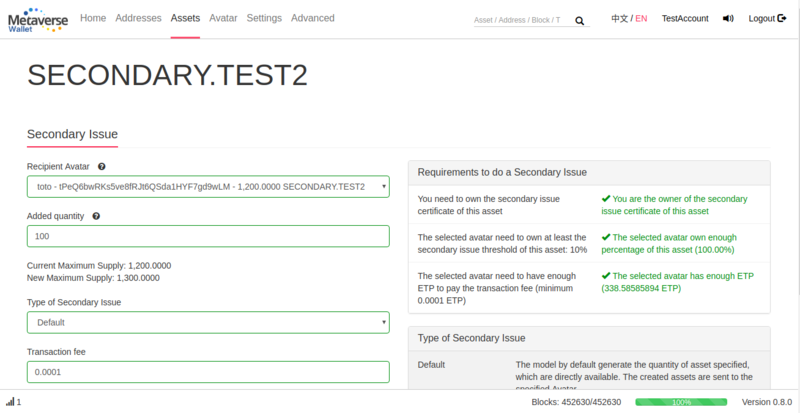 The issuer of an asset automatically get this certificate if the Secondary Issue option has been specified. 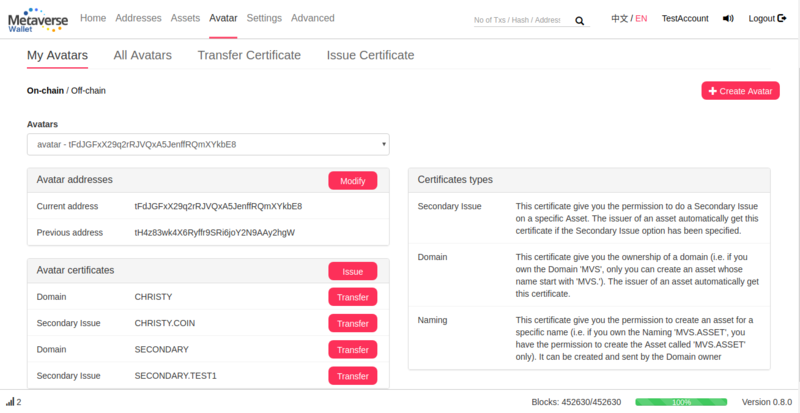 Domain: This certificate give you the ownership of a domain (i.e. if you own the Domain ‘MVS’, only you can create an asset whose name start with ‘MVS.’). 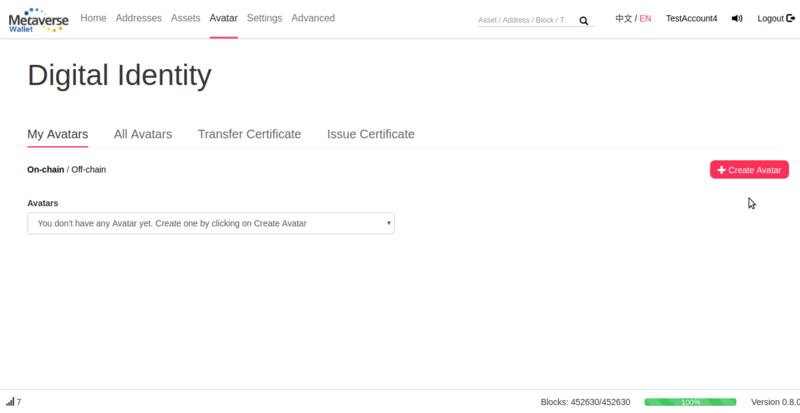 The issuer of an asset automatically get this certificate. 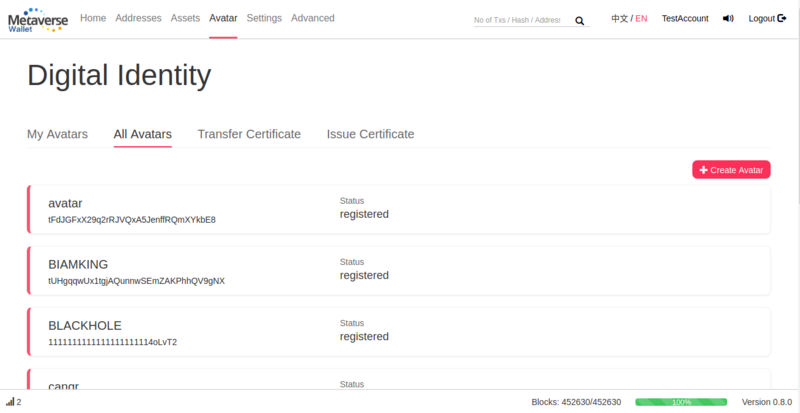 You can issue a certificate from the ‘Transfer Certificate’ page. 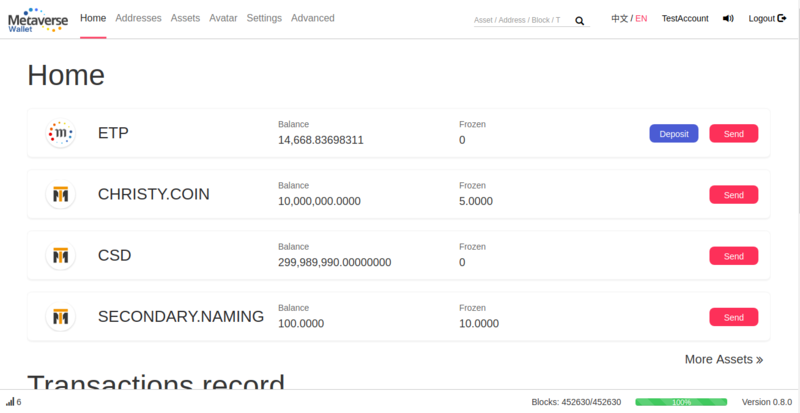 Currently, only a Naming certificate can be issued since the Secondary Issue and Domain certificates are automatically generated at the Asset creation. 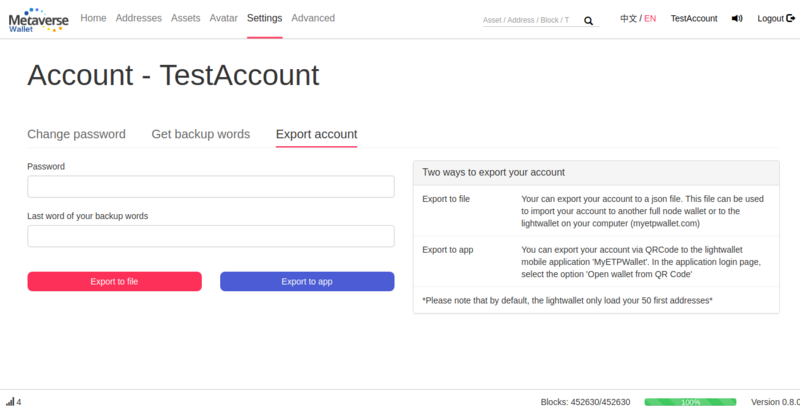 You can export your account to a key file via the option ‘Export to file’. This file contains your backup words encrypted via your password. 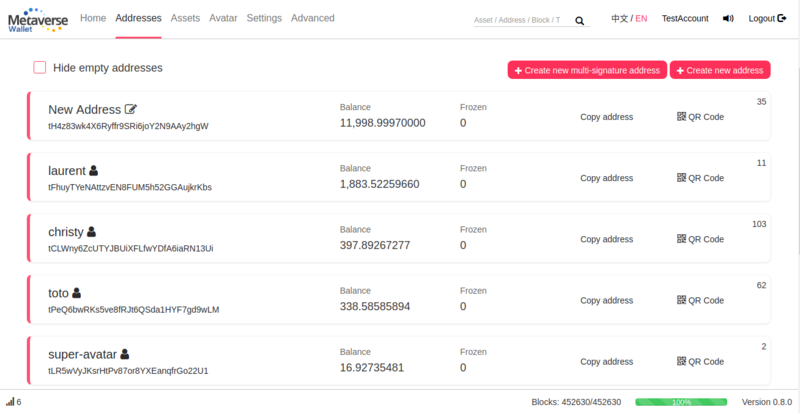 It can be used to import your account to this wallet (full node wallet) on another computer or after an update for instance. 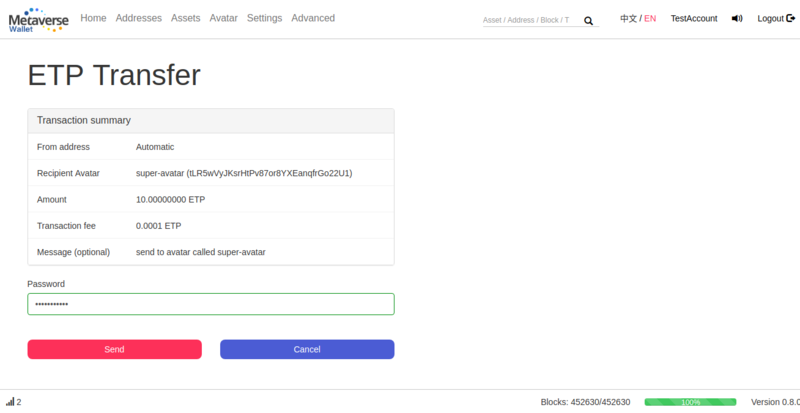 It is also compatible with the lightwallet (http://myetpwallet.com) and can be use to directly open your account in the lightwallet. 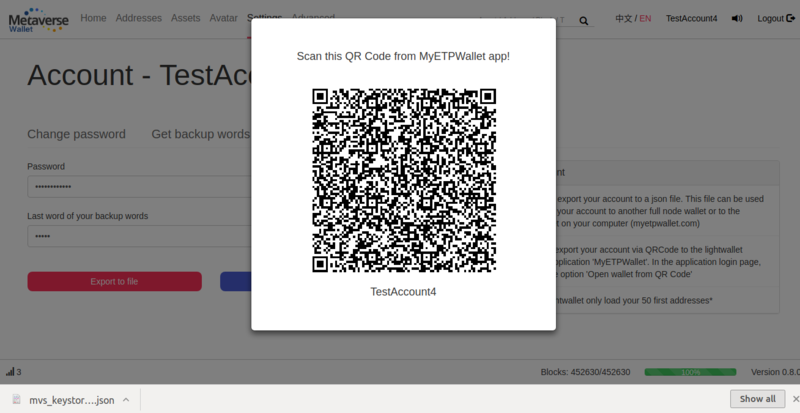 To export your account to the mobile application, simply click on ‘Export to app’ and scan this QRCode via MyETPWallet app. This QR Code contains your backup words encoded via your password, so your password will be asked in the app in order to decrypt it.